Introduction: This study evaluated and compared techniques of postspace preparation for induction of dentinal microcracks utilizing microcomputed tomography (CT). Materials and Methods: A total of 45 extracted micro-CT scanned mandibular premolars were prepared and obturated. After the second micro-CT, samples were divided into three groups (n = 15). In Group 1, postspace preparation was done using hand K files up to the size of #110. In Group 2, postspace preparation was done using Peeso reamer up to the number of #3. In Group 3, postspace preparation was done using ParaPost XT Drills with the tip diameter of 1.1 mm. Thereafter, the third micro-CT scan was performed for microcracks evaluation, and statistical analysis was performed. Results: Few unprepared samples showed the presence of microcracks (1.54%). There was statistically significant (P < 0.05) percentage increase in the number of microcracks after root canal preparation and obturation (5.44%) and after postspace preparation (8.35%). The percentage increase in microcracks observed for Group 1, 2, and 3 from obturation to postspace preparation was 0.19%, 4.21%, and 6.86%. There was a significant difference among the three techniques of postspace preparation (P < 0.05). Conclusion: Microcracks may exist preoperatively. Postspace preparation increased the number of microcracks irrespective of the technique utilized. ParaPost XT Drills produces maximum microcracks in the root dentin followed by Peeso reamers and K files. The restoration of endodontically treated teeth frequently may require the use of post and core system for retention of coronal restoration. During the postspace preparation, the canal is enlarged to a size that corresponds to the final dimension of the selected post. Thus, considerable amount of dentin is removed; this removal of further dentin may produce forces on the dentin leading to defects in the dentin which coalesces and may form cracks and may ultimately lead to vertical root fracture. There is a direct relationship between the amount of dentin removal and crack formation; the greater the canal enlargement and the higher the incidence of dentinal cracks or vertical root fracture. Postspace preparation is done after removing Gutta-percha (GP). Various techniques for postpreparation which makes the use of hand files, peeso reamers, and ParaPost XT Drills can be employed after removal of GP from the canal either with heated endodontic instruments or rotary instrument or by chemical methods. As each technique may induce different percentage increase in crack initiation and propagation. This study comparatively evaluated the different techniques of postspace preparation for the induction of dentinal cracks. Forty-five, single-rooted teeth were extracted for periodontal reason and were stored in chloramine T-solution for 24 h followed by normal saline until in use. Teeth with root fractures, root caries, cracks, calcified canals, pulp stones, hypercementosis, evidence of periapical resorptive processes, multiple canals, or canal with curvature >20° were excluded. The degree of root canal curvature was determined by Schneider's method. Teeth were decoronated using a double-sided diamond disc (S S White Dental Inc.,) to obtain a standardized root length of 17 mm. The roots were coated with a thin layer of polyether impression material (3M, ESPE, Monophase Soft) and placed in acrylic resin. Micro-CT scans (Phoenix v/tome/x m, Germany) were captured before and after instrumentation at 75 kV and 400 uA. The long axis of the roots was adjusted to be perpendicular to the beam to provide scans in the same sagittal positions. Each root was rotated 360° with a total scan time of approximately 2000s. Approximately 1000 CT slices (pixel pitch 200 μ and voxel resolution 30.5 μ) were obtained per root. Preoperative micro-CT of all the samples was done to assess the presence or absence of cracks before the endodontic procedure. A #15 K file was inserted into the canal, and working length was established by deducting 0.5 mm from this length. The root canals were prepared using rotary ProTaper Universal (Dentsply Maillefer, Ballaigues, Switzerland) to size F4. The canals were irrigated with 1 ml of 3% sodium hypochlorite solution (Prevest Denpro, Jammu) followed by 5 ml of 17% ethylenediaminetetraacetic acid (Prevest Denpro, Jammu) and saline. Obturation was done using single-cone technique with GP and AH plus sealer (Dentsply, De Trey, Germany). The coronal 3 mm of GP was removed from canal with heated plugger, and orifices were sealed with Cavit. Roots were stored for 1 week at 37°C and 100% humidity to allow the sealer to set. Second micro-CT imaging was done to evaluate the development of cracks after root canal preparation and obturation. Thereafter, samples were randomly divided into three groups on the basis of a method for postspace preparation. Temporary coronal filling material was removed, and 2–3 drops of xylene were dispensed into the canal space. ProTaper Universal retreatment (Dentsply Maillefer, Ballaigues, Switzerland) files were used at a speed (500–700 rpm) for GP removal up to 12 mm to leave 5 mm GP apically. Without engaging dentin, the spinning ProTaper D1 file (30/09) was gently engaged into the GP to create friction, generating a heat wave, and auger material out of the canal. Intermittent irrigation of the canal was done using distilled water. After that, the ProTaper D2 file (25/08) was used; it was continued as long as the flutes of the instrument, on removal, were no more loaded with obturation material. Thereafter, irrigation was done with distilled water, and small-sized stainless steel hand K files (#25 to #110) (Dentsply Maillefer, Ballaigues, Switzerland) were used initially along the circumference of the canal wall, thus widening the canal space to aid in postspace preparation. K file #25 was followed by K file # 30, 35, 40, 45, 50, 55, 60, 70, 80, 90, and 100. In between, every filing sequence, irrigation was done using 5 ml of distilled water, and canals were dried by sucking extra fluid out of the canal with the help of syringe followed by drying with paper point (Dentsply Maillefer, Ballaigues, Switzerland). Thereafter, filing was done until # 110 K file along the circumference of the canal. Pluggers were used to compact the remaining root filling mass. Cleanliness of the canal walls was confirmed by taking radiographs of the specimens mesiodistally and buccolingually. The GP was removed up to 12 mm in the same manner as in Group 1. Thereafter, postspace preparation was done using Peeso reamer #1, #2, and #3 at low speed (500–800 rpm) in a push and pull motion up to 12 mm, thereafter radiographs were taken. After removal of GP, postpreparation was done with ParaPost XT Drill (Coltene Whaledent, USA) with the tip diameter of 1.1 mm at a slow speed (750–1,000 rpm) in the continuous clockwise rotation with contra-angle handpiece. After postspace preparation in each group, micro-CT imaging was done. Preoperative, postobturation, and after postspace preparation, horizontal micro-CT image sections of the same root levels were evaluated on 17-mm apical segments of roots at 0.25-mm intervals to detect microcracks. In total, 3060 slices were evaluated. If there were no microcracks or craze lines both on the external surface and on the internal root canal wall, the slice was accepted as having “no crack” and was numbered zero. If there were any craze lines, microcracks, these were categorized as cracks, and the total number were noted [Figure 1]. As the number of preexisting cracks differed from sample to sample, percentage increase in number of cracks was evaluated to standardize the procedure and minimize the error. The results were analyzed using software version 19.0 (IBM Corporation, Armonk, NY, USA) statistical analysis software. Comparison among and within the groups was done using Student's t-test. There was increase in the mean percentage of dentinal microcracks (P < 0.05) during root canal preparation and obturation. Postspace preparation further increased the mean percentage of dentinal microcracks after root canal obturation (P < 0.05) [Figure 2]. Intergroup comparison among postgroups showed significantly more microcracks formation with ParaPost XT Drills as compared to Peeso reamer and K file. Peeso reamer produced more microcracks than K file (P < 0.05) [Table 1]. In the present study, the micro-CT imaging of samples before initiation of root canal procedures revealed preexisting microcracks in some of the samples; however, remaining samples were free of cracks. These preexisting dentinal microcracks may be attributed to noniatrogenic factors such as age changes, the effect of functional stresses such as occlusal interference or parafunctional stresses, any excessive force on teeth during extraction or environmental changes in dentin-like dehydration., Arias et al. reported preexisting microcracks in 4 of 6 teeth in their control group. Moreover, they also reported that preexisting root dentinal microcracks in mandibular teeth (10.3%) are significantly higher than in the maxillary teeth (2.9%); therefore, only mandibular premolars were utilized in the present study. In this study, cleaning and shaping were done with rotary ProTaper universal file using crown-down technique. Here, there was the percentage increase in the number of dentinal cracks after root canal preparation and obturation as compared to preoperative cracks, and this increase was found statistically significant (P < 0.05). The results are in accordance with previous published studies. Shemesh et al., Kumar and Subbiya, and Harandi et al. have also reported that canal preparation could cause significant dentinal defects. Bier et al. stated that obturation leads to increased number of cracks. Yoldas et al. also indicated that various procedures such as obturation create fractures or craze lines. 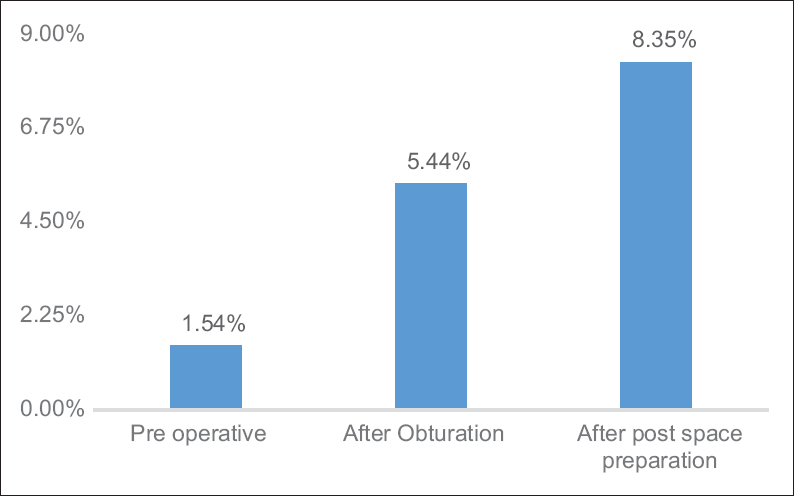 The micro-CT imaging in the present study revealed that the postspace preparation group had a significant increase in the percentage of cracks when compared to the preoperative and the postobturation groups. There was an increase in the mean percentage of cracks in all the three groups, and the difference among all the three groups was statistically significant. This can be attributed to more amount of dentin loss during postspace preparation and less amount of remains dentin thickness. In this study, during postspace preparation, maximum cracks were formed by ParaPost XT Drills followed by peeso reamers and K files. Several possible factors which may be responsible for mentioned results are different instrument designs such as tip design, cross-section geometry, and flute form of the instruments, different instrument alloys, and different rotational speeds of the instruments. More cracks were formed with rotary instruments, i.e., ParaPost XT Drills and peeso reamers than hand instrumentation, i.e., K files, as rotary systems produce more rotations of the instruments inside the canal which may create more friction between the instrument and canal walls whereas hand instruments perform complete shaping with significantly fewer rotations. When rotary instruments are used, a torque force is exerted on the canal walls. Hence, it can lead to the formation of more microcrack in the root dentin. Although the amount of dentin removed was similar in all the groups, more number of instruments were used to remove the dentin, as well as dentin removal was gradual and slow which produces less stress on the dentin with K file as compare to Peeso reamers and ParaPost XT. Moreover, instrument design may also affect the development of dentinal cracks. Peeso reamers have a triangular cross-section which may be attributed as one of the causes for the increased incidence of microcracks whereas K files possess a square cross-section producing lesser number of cracks. In our study, ParaPost drill produced more dentinal cracks as compared to Peeso reamers. The results of this study are in accordance with the study done by Çapar et al. they concluded that the reason for the increased number of microcracks after the use of drills may be because of excessive forces applied during dentin removal caused by stiff drills. ParaPost drills were operated at higher recommended speed than peeso reamers thus leading to more stresses on the residual dentin which may also affect the number of cracks produced. In Peeso reamers, three (no 1, 2, and 3) instruments were used to remove dentin, and there was the sequential removal of the dentin as compared to ParaPost XT Drills which utilizes only single drill to produce similar sized postspace. As a larger drill is directly used to remove more amount of dentin at a time, it may produce more cracks in dentin. Moreover, the numbers of spirals are more in drills thus increasing the contact area between the instrument and the canal wall thus producing more stresses on the dentin ultimately producing more dentinal microcracks. Within the limitations of the present study, it can be concluded that microcracks may exist preoperatively. There is a significant increase in the induction and propagation of microcracks during root canal preparation and obturation. ParaPost XT Drills results in a maximum number of increases in the crack formation and propagation, followed by Peeso reamers and K files. However, further studies are needed to investigate their effects on the tooth structure. Wilcox LR, Roskelley C, Sutton T. The relationship of root canal enlargement to finger-spreader induced vertical root fracture. J Endod 1997;23:533-4. Bakland, Baumgartner. Ingle's endodontics 6th ed. Ontario, BC Decker, 2007, pp. 345-346. Ceyhanli KT, Erdilek N, Tatar I, Celik D. Comparison of proTaper, raCe and safesider instruments in the induction of dentinal microcracks: A micro-CT study. Int Endod J 2016;49:684-9. Robbins JW. Restoration of the endodontically treated tooth. Dent Clin North Am 2002;46:367-84. Sathorn C, Palamara JE, Messer HH. A comparison of the effects of two canal preparation techniques on root fracture susceptibility and fracture pattern. J Endod 2005;31:283-7. Shemesh H, Bier CA, Wu MK, Tanomaru-Filho M, Wesselink PR. The effects of canal preparation and filling on the incidence of dentinal defects. Int Endod J 2009;42:208-13. Chan CP, Tseng SC, Lin CP, Huang CC, Tsai TP, Chen CC, et al. Vertical root fracture in nonendodontically treated teeth – A clinical report of 64 cases in chinese patients. J Endod 1998;24:678-81. Arias A, Lee YH, Peters CI, Gluskin AH, Peters OA. Comparison of 2 canal preparation techniques in the induction of microcracks: A pilot study with cadaver mandibles. J Endod 2014;40:982-5. Shemesh H, Roeleveld AC, Wesselink PR, Wu MK. Damage to root dentin during retreatment procedures. J Endod 2011;37:63-6. Kumar AR and Subbiya A. Cracks and fractures in teeth. J Oper Dent Endo 2017;2:25-30. Harandi A, Mirzaeerad S, Mehrabani M, Mahmoudi E, Bijani A. Incidence of dentinal crack after root canal preparation by proTaper universal, neolix and safeSider systems. Iran Endod J 2017;12:432-8. Bier CA, Shemesh H, Tanomaru-Filho M, Wesselink PR, Wu MK. The ability of different nickel-titanium rotary instruments to induce dentinal damage during canal preparation. J Endod 2009;35:236-8. Yoldas O, Yilmaz S, Atakan G, Kuden C, Kasan Z. Dentinal microcrack formation during root canal preparations by different niTi rotary instruments and the self-adjusting file. J Endod 2012;38:232-5. Liu R, Kaiwar A, Shemesh H, Wesselink PR, Hou B, Wu MK, et al. Incidence of apical root cracks and apical dentinal detachments after canal preparation with hand and rotary files at different instrumentation lengths. J Endod 2013;39:129-32. Çapar İD, Uysal B, Ok E, Arslan H. Effect of the size of the apical enlargement with rotary instruments, single-cone filling, post space preparation with drills, fiber post removal, and root canal filling removal on apical crack initiation and propagation. J Endod 2015;41:253-6.